This article was written by Justin Nelson of Top Priority Hunting. Top Priority Hunting is a group of guys who share their passion for the outdoors through high quality films and photography. See their content at @TopPriorityHunting on Instagram or at www.toppriorityhunting.com. You can also see them in our upcoming Bear Wars film series project at Muley Freak. These tips come from over a decade of trial and error hunting bears over bait. Baiting bears, and baiting in general, is one of the most controversial and misunderstood forms of hunting. Although baiting has been around forever, many people have a misunderstanding that it’s inhumane, takes little effort, and is cheating. Some think that you just throw out some nasty food and shortly after a bear comes waltzing in and you shoot it. That couldn’t be further from the truth. It’s actually one of the most physically and mentally demanding type of bear hunts you can do. Over the years I’ve picked up some important things through trial and error that I feel will help any hunter in setting a bait. 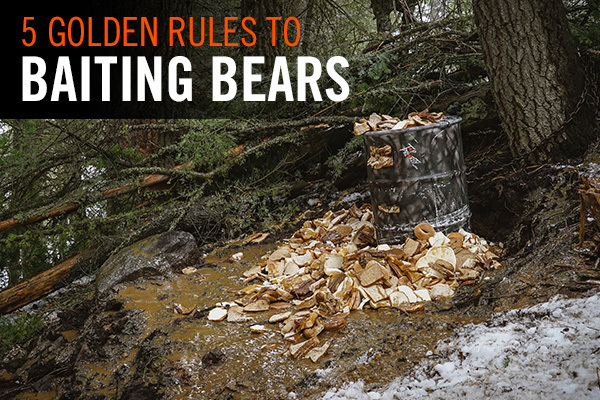 Here are 5 golden rules to I live by when bait hunting bears. The Location: First and foremost, your bait location is by far the most important part. Obviously there needs to be bears in the area. A quick scouting trip into the area can give you some useful insight in making sure you’re not just going to be feeding squirrels and birds for the whole season. Look for turned over rocks and logs. Also keep your eye out for shredded stumps, as this is a great sign that there is a bear or bears in the area looking for insects. Look for a place to set a bait station where there’s little human pressure. 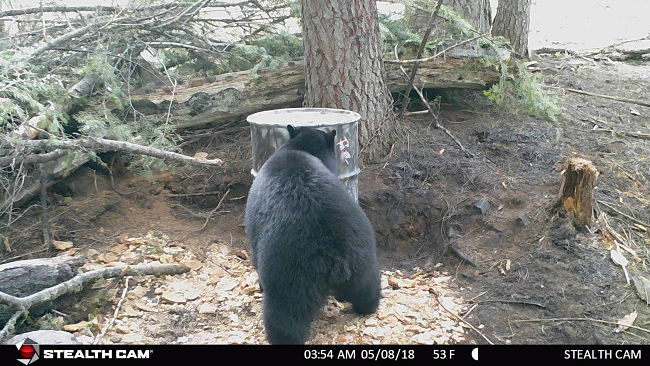 Having your bait to close to town or around easy access areas can result in multiple bear/human conflicts, and the last thing you want is for your bait to be the center of a recreational area. Set your bait in a dense, dark area with water near by. I also look for a place that will help carry the smell of the bait up and down the mountain. If your bait is down in a hole the scent will have a hard time carrying out and across the terrain. Ideally look for a knoll on a mountain where your baits scent can drift easily. Once you start hunting your bait be aware of your entry point to the bait as well where the bears are coming in from. Bumping a bear while you are entering your stand or blind can change a bears pattern and most of the time that means hitting your bait at night. Although it’s as simple as positioning your bait, I’ve gone seasons where I didn’t see a bear because of a poor setup. The Wind: Once you pinpoint your bait location it’s time to look for an ideal setup between the bait itself and your blind or tree-stand. Study the terrain and position your bait so that your stand and bait work together. Bears typically feed in the evening hours, so pay attention to the thermals and wind direction. If you’re completely new to the area you can actually wait on hanging a stand or blind to try and determine the direction the bears are coming from. If they’re coming in from below your chances are they’ll wind you so you might have to find a new area. Remember a bear’s nose smells a hundred times better than a humans, so don’t take the wind for granted. I’ve hunted several nights and have had to wait before I’ve entered my bait because of the wind. If you’re not patient, the wind can ruin your bait site, not only that night, but it can make the bears very unsettled, resulting in only nocturnal feeding. The more the bear feels safe the more they will come in during shooting hours. Don’t hunt your bait when the wind is bad. In the long run you’ll have more success by shortening your hunt when the wind is not in your favor. Stay patient, a bears sense of smell is his strongest defense. 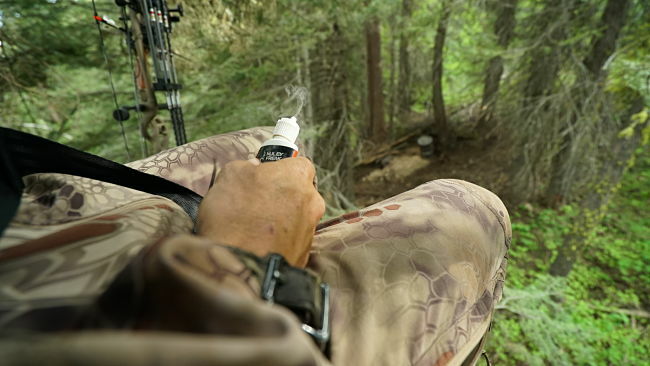 The Bait: Bait scent is the first thing you want to focus on when picking out your bait. Just because you have the sweetest most delicious donuts doesn’t mean the bears can smell it. Start with used oils and grease. The stinkier, the better. You can find used cooking oil and grease just about anywhere. The rank scent will fill the area and you’ll have every bear in the area on the prowl. Pour the oils and grease in front of your bait. You want to pour it out so that a bear has to walk through it. As the bear leaves, his pads will be covered and will create a trail of scent away from the bait. Over time different bears will walk across the scent path of the bear that hit your bait and they’ll follow it back, leading them into the buffet line. The more bears that are in contact at your bait site, the higher your chances are of bringing in even more bears. Once you’ve got the bears attention, it’s now time to feed them. Bears will eat just about anything. Depending on your budget, or if you get a hookup, your bait can vary. We have found that breads, donuts, dog food, and popcorn all seem to work great and can be fairly easy to get your hands on. Bears love to load up on carbs and can spend hours devouring several hundred pounds, so make sure you’ve got plenty of bait. Expect a 55 gallon drum to be empty in 3-4 days with a 5 bear average. The bait can go quick so make sure you have plenty of it. DO NOT let the bait run out. This will result in the bears leaving and may take several weeks for a bear to return. There are new companies out today that specialize in bear attractants. One of those is Boarmasters. We’ve been using these products for about 5 years now and the stuff works extremely well. Take any boring, dull no smell bread and add some Boarmasters products, now you have a super charged bait site that the bears can’t resist. 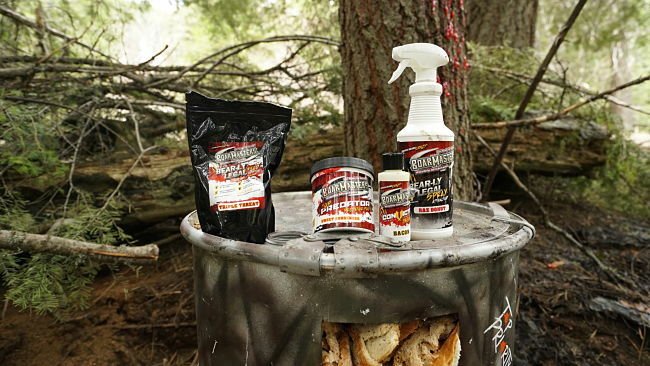 You can add these attractants to just about anything. The better the taste, the better the smell, the more bears you’ll have consistently hitting your bait. The Trail Cams: Trail cameras can be a huge advantage to a hunter. 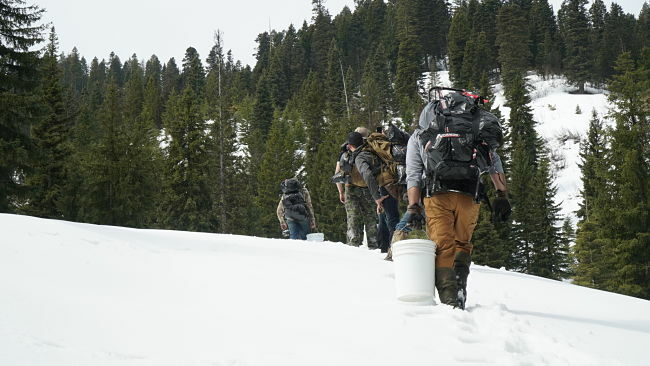 They are extremely useful, or even a necessity, in figuring out how many bears are hitting the bait, the quality of bears, and what time the bears are coming in. Bears are creatures of habit so knowing when they come in will often show you their patterns and then you can plan your hunt around the activity. One struggle you will face at some part of your baiting career, is a nocturnal bear. Although seeing the pictures of the bear in their most comfortable form is pretty cool, it’s not exactly what you want. The more they hit at night the more comfortable they will be sticking to the late night feedings. One of the most challenging things is judging a bears size. There are no antlers, so you have to really pay attention to characteristics of a bear. Trail cameras help determine bear height, size of head and the demeanor. 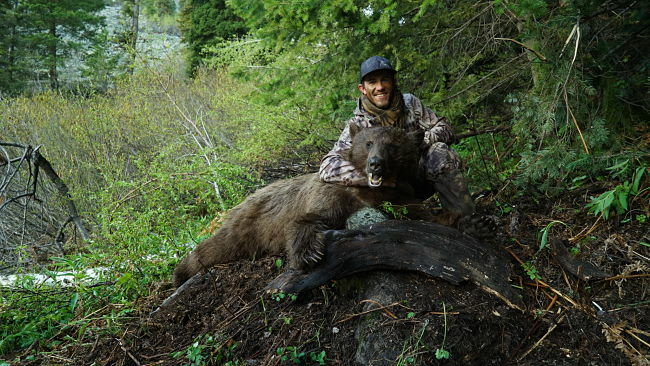 Studying pictures before you go hunt will help you determine a trophy bear over an average bear. Keep in mind to set trail cameras first before you get any scent on your hands from the bait, or you just might end up with a mangled camera the next time you go into hunt. Bears can smell the slightest scent and when they are bored, they’ll demolish the camera. The Persistence: Time in the stand can be the deciding factor of success. If you are willing to spend countless hours sitting and sitting, your chances at a bear greatly increase. I’ve gone several seasons where I’ve not even seen a bear after four to five sits. I’ve gone a few seasons with only seeing one or two bears but I’ve also seen hunters harvest on their first sit. The key is to be patient. You never know when a bear is going to come in. The biggest bear I’ve ever harvested hit my bait one time at 4 a.m. and then two weeks later, he came in and I shot him at 9 p.m. Sitting baits can be mentally draining. Your eyes are constantly searching, and your mind starts to see things. Stay focused. Bears can slip in to your bait so quietly, and the slightest movement can send them running. Having mental fortitude and the willingness to sit for hours can be the determining factor to your success. Be prepared to sit in the elements, deal with mosquitoes, and get a sore rear. As long as you are in the stand, the wind is good, and there is bait, you have a chance. It can take weeks of preparation but sometimes it only takes a few minutes to have a bear on the ground. Baiting black bears is just like any other hunt. If you’re new to it, it’s going to be a challenge but stay consistent, keep at it, continually learn and the results will hopefully be in your favor. Everyone that has hunted bears knows that no matter how many times you sit or how many hours you’re in the stand when you finally see one there is no other adrenaline rush like it. Hunting bears off of bait is like a chess match. You’ve made your move by baiting, now it’s his move. Hopefully you’re the one calling checkmate. Very insightful article on baiting bears! Looking forward to more articles like this one. Great job boys.